Oh how sweet they are!! I´m looking forward for many photos of them! 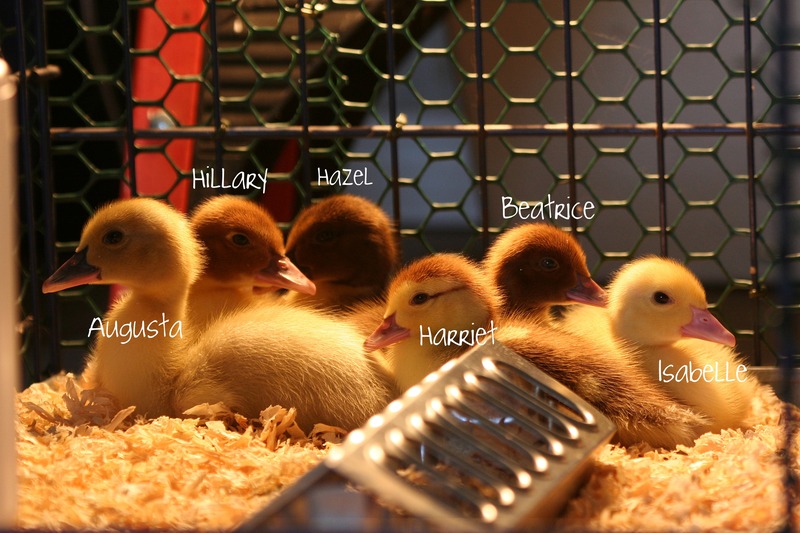 Did Don go out to the feed store and come back with a box of ducklings? 🙂 They are impossibly cute!! Whoo-hoo! Can’t wait til Bernard meets the girls. 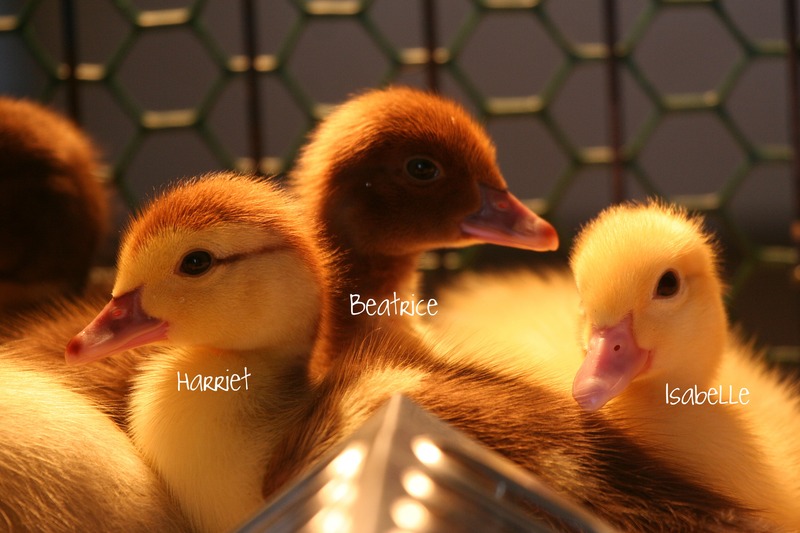 Beatrice – Smallest duck. Brown with yellow wing tips and pink bill. 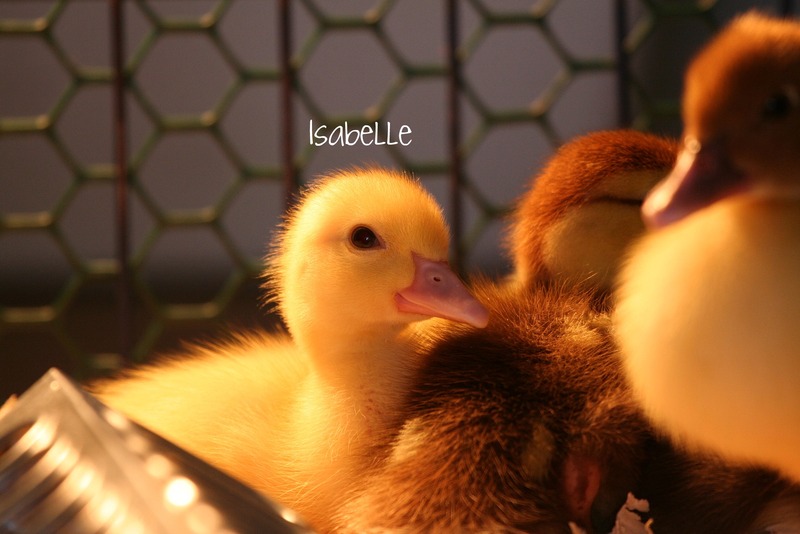 Isabelle – Lightest yellow with pink bill. 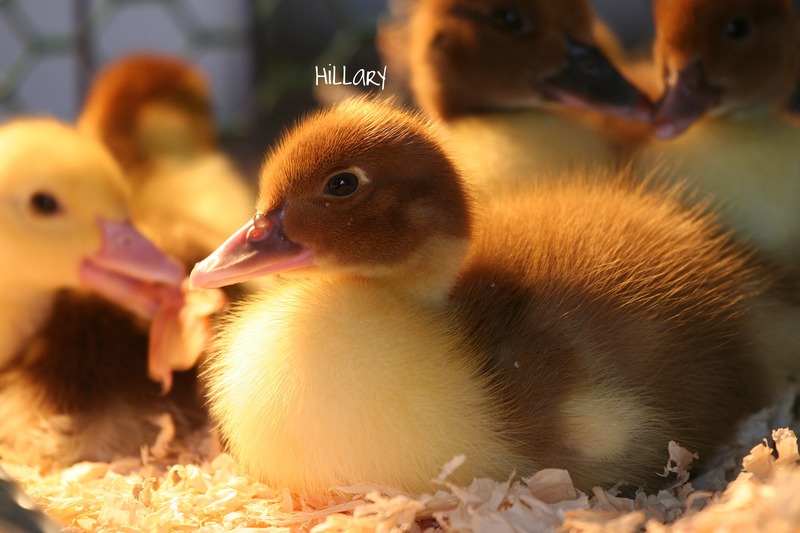 Hillary – Light brown with pink bill. Yellow eye shadow. 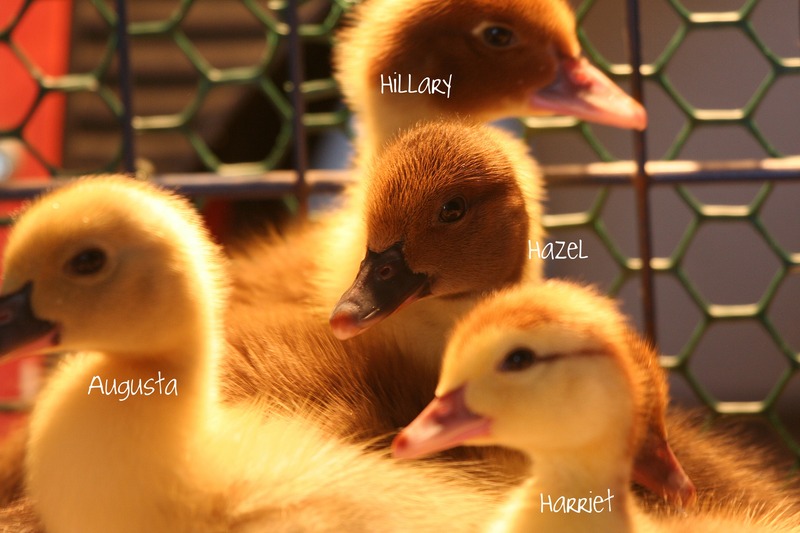 Hazel – Darkest duck. Dark bill. Yellow chest. Augusta – Darker yellow with dark bill. Harriet – Lines at eyes and spots on back. No pond yet, but hopefully by the beginning of July. OK, it is now proven. Morning Bray Farm is becoming the black hole of cuteness!! They are so cute. I love seeing them swim! Awww they are so cute!! 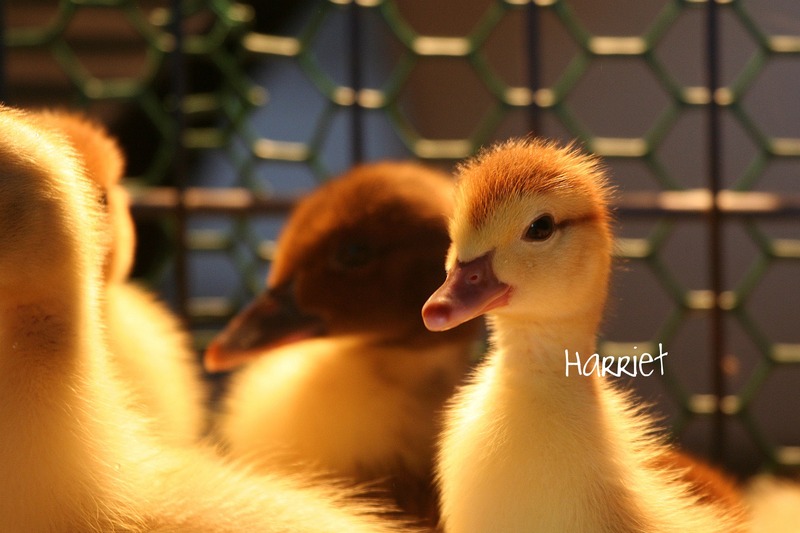 I loved raising ducklings even though they were incredibly messy lol. 🙂 I think ducks are my favorite poultry to photography. They are just so fun. Was that your Easter present from Don? So cute…. What a lovely ducks! Looks all them enjoy so much the pool! They are so adorable! I scrolled down the pictures several times savoring them before I could make a comment. I love ducks! I’m looking forward to watching these babies. I may just drop down dead onto my computer from a cute overload. Oh my. Beautiful pics too Justina. That’s a lot of duckies! Are you planning on putting in a pond? I imagine the water microbursts will require a bit more room soon! Yes, we are. 🙂 We’re going to ask Don’s sister for her help putting one in when she’s here for a visit in July. The cuteness factor is just POPPING off the charts over there at Morning Bray 😀 QUACK! They’re so lucky they didn’t get bought as Easter presents for some kids who’d soon get bored of them. That happens to so many Ducklings and Bunnies this time of year and then they get neglected or turned in at shelters. Gorgeous pics, btw – incredible lighting. Well done! What a fantastic surprise! They are so cute and look really cuddly. Now Patrick isn’t the new kid on the farm! The cuteness factor just went way up at MBF!